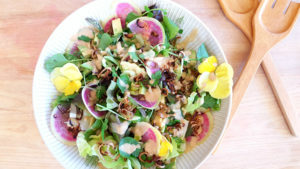 The bright colors and fresh new greens of spring are bolstered with a rich dressing and crunchy shallots in this salad for the season when the weather plays tricks on us. This year it has taken several weeks of gorgeous weather to finally roust me from making my usual winter staples like hearty stews and platters of roasted root vegetables. The recent sunny days have finally begun to get me in the mood for lighter and brighter dishes. 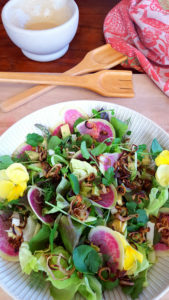 This salad showcases the beautiful and tender spring vegetables which are showing up at local markets and in my garden this time of year. But since, of course, this is the season when mother nature likes to pull the rug out from under us when we least expect it; sweeping in with a blast of cold air, or even one last snow storm like my hometown of Albuquerque got this weekend, I insulated this light and bright salad with a comforting blanket of creamy, garlicky sesame miso dressing and a scattering of crispy fried shallots. Any assortment of early spring greens will go nicely here. 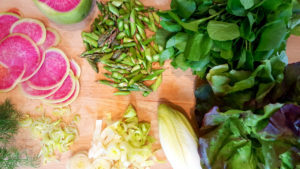 I started with tender, new red-tipped lettuce then tucked in paper-thin slices of watermelon radish, fresh green asparagus, spring onions, bright watercress and herbs. I then added heavier endive for texture, avocado for substance and crowned it with sunny yellow pansy’s, because it wouldn’t be spring without the flowers! 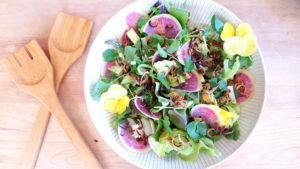 Start with a base of any tender spring lettuce and add the rest of the ingredients in whatever amounts suit your mood. If you prefer it a bit on the sweet side a teaspoon of coconut sugar or date paste will do the trick. 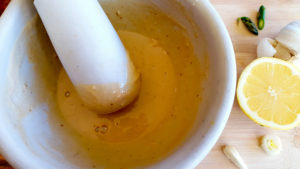 Mash the garlic in a mortar and pestle (or you can mash it into a paste by mincing it first then smashing with the side of a knife), add the remaining ingredients and work with the pestle until you have a smooth creamy dressing. Taste and adjust the flavors, adding a little water if needed to thin. 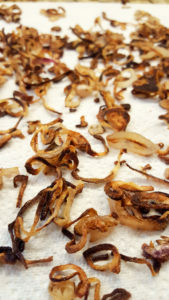 Peel and thinly slice the shallots. Heat olive oil in a heavy bottom pan over medium heat. When the oil is hot, toss in the shallots and stir often until well browned, but don’t let them burn! This should take about 15-20 minutes; if they’re browning too fast reduce the heat. Once they’re cooked through to a dark golden brown spread them out on a paper towel to crisp up until ready for use. Mmmm, looks great! Not to mention beautiful. I will have to try this recipe soon.